Shell stitch: Insert right-hand needle into the front of the stitch 5 rows below the 3rd stitch on the left hand needle, and draw through a long loop, leave loop on right-hand needle and knit 1, make second loop into same stitch, knit 1, make third loop into same stitch, knit 1, make fourth loop into same stitch, knit 1, make fifth loop into same stitch, knit 1, make sixth loop into same stitch. 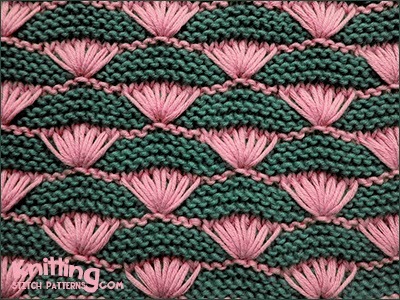 With color A, cast on a multiple of 14 sts plus 2 additional sts and knit one row. Row 1 - Right side: With color B, knit. Row 2: With color B, knit. Row 3: With color B, knit. Row 4: With color B, knit. Row 5: With color B, knit. Row 6: With color B, knit. Row 7: With color A, * k9, shell stitch; repeat from * to last 2 sts, k2. Row 8: With color A, k1, * (p2tog-b) x3, p1, (p2tog) x3, k7; repeat from * to last st, k1..
Row 9: With color B, knit. Row 10: With color B, knit. Row 11: With color B, knit. Row 12: With color B, knit. Row 13: With color B, knit. Row 14: With color B, knit. Row 15: With color A, k2, * shell stitch, k9; repeat from * to end. Row 16 With color A, k1, * k7, (p2tog-b) x3, p1, (p2tog) x3; repeat from * to last st, k1. Purl 2 sts together: P2tog | P2tog-b: Purl 2 sts together through the backloop.